Rain as I drove onto the road. And rained. And rained. According to the weather team at KOMO in Seattle, we have already had more rain this year than fell in all of 1952 (the driest year on record). A short article was posted to their blog this morning. Yesterday we worked on the house. Grant and Tom (and Mady) got the wardrobe boxes finished. Mady and I (and Tom) made progress on the tile in the shower. Tabitha visited with her baby bird (I got to hold it!). It rained, drizzling gently at first, then more and more insistently until in the evening when we were driving home from town – with still more mortar for the shower – traffic on the highway slowed to 45. I was surprised we didn’t have lightning, it was so stormy! Today we will get enough tile up in the shower that we can put the rest of the bathroom fixtures. Well, our amazing plumber will put in the rest of the fixtures this week. I will finish the remainder of the tiling next weekend… Mady will help again and I will ask her to help with replanting a few pots and boxes. I need some pretty plants again — most of them died in the extreme cold of last winter. And in between, it will be raining. I have a full week of teaching, including some extra hours in the mornings for three days (the money will come in handy!). Then a full week the week after, then I am taking my first-ever personal day for a four-day week, and a four-day week after that for the Memorial Day weekend. Right now, I have 40 calendar days until the end of the school year. Hopefully, fewer than that before we are approved to move in to our home. and it started pouring down HAIL. Big, loud, dropping like marbles from angry thunderclouds. The parking lot at the apartment in town is white with hard pellets and deep in water. For the record, I think we have had rain for at least part of every day since the first week of April. The news channels are reporting that we have had record rainfall this last couple months — and if we had had normal rainfall over the winter (it was extraordinarily dry) it would be a very very wet season. Meantime, we are still setting records for rainfall right now, even as we anticipate a very much longer dry season than normal. I think today’s outdoor work will wait until tomorrow afternoon. Meantime… Packing, shopping (online), and working on professional obligations (school-based evaluations for my performance, and contacting people who have been references for me in the past to see if they will “re-up.”). Tomorrow I can get into the house. I will start working on tiling. If I am careful, I can get things set up for doing the floor of the shower on Tuesday. And the walls on Wednesday and Thursday. I will let the plumber know he can come and finish up on Friday… I will just have to bite the bullet and get it done. Hope the hail hasn’t damaged the fruit trees at home! We get rain here. A lot. And frequently. It is rarely torrential, thankfully, but it leaves us feeling soggy a good bit. Because our rain exists as a “state of being” for months at a time, rainbows are fairly uncommon most times of the year. When they do show up, they can be hard to see behind the trees and the hills. Gold, on the other hand, is abundant this time of year. We have red-gold catkins on the alders, lingering tawny gold grasses from last year’s autumn, a greenish-gold hint of color on the ends of the maples and willows, and wherever humans have settled, mounds of yellow-gold that cascades across lawns and hills. A quick run through the garden on Friday yielded an abundance of colorful – and golden – opportunities to see the season changing in the moment. Friday night when I got home I noticed a pair of daffodils almost blooming by the edge of the driveway. Yesterday, they were in bloom, and today they have been joined by some of the daffodils under the medlar. There have been several years when our weather was contrary to the weather in other parts of the country, this one seems more extreme for some reason. We have had “spring like” weather for the last two months. Back in the middle and eastern sections of North America, it is cold, with 2 monster storms since November, and moderate storms filling in the gaps. The hardship of last summer’s drought is now being matched by the hardship of this winter’s blizzards and extreme cold. In the fullness of autumn, we wandered around the yard, putting things more or less in order, getting ready for the long, cool winter. These are pictures from November, when the rains paused long enough to get a bit more done. Pruning the medlar and the biggest fig tree. Running around the yard with a toy in mouth. Looking at (and eating) the last, sun-deprived-sour blackberries. Admiring the shapes of trees being exposed by leaf fall. Waiting for a change in the weather (which, not coincidentally, occurred just this week; today, in fact). The pics in the gallery can be expanded to full size by clicking on them, use your browser’s “back” button to return to this page. There is a pattern developing in the weather! Although the forecasters are predicting a drier than normal autumn and winter (which I would rather not have! ), for the moment the weather seems mostly to have settled in to a comfortable rhythm. What puzzles me at the moment is that, most years, the bigleaf maples are glowing with bright yellow leaves (unless it has been raining a lot in which case they are rust-colored). This is from about 3 p.m. today. Click on the picture to play the video. Use your browser’s “back” button to return to this page when you are done. Last Sunday, it rained. The day was gray, humid to a point, and the overcast made everything seem bluer than normal. I worked on refinishing some picnic furniture, getting a coat of polyurethane on to help it make it through a few more years. As the day wore on, the clouds lowered, settling in near the tops of the trees with sinister intent. It was still. 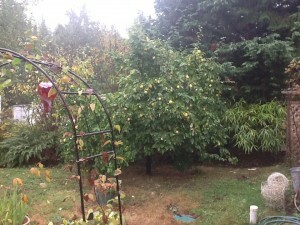 Nevertheless, we watered the garden, knowing that if we didn’t the rain would hold off. It always does, when the plants need it in August. So we watered, and went inside.